This past week I’ve been adding more plants in the containers around the pool. 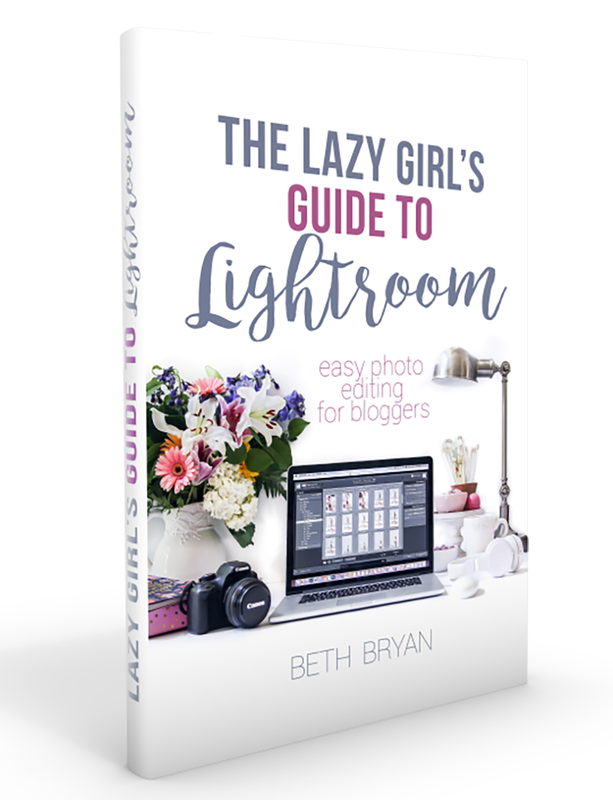 Here is one of my newest favorites! Check out the checkerboard pattern of this moss. I spotted it across the garden center at Walmart and knew I had to have it. I love the way it looks inside a chicken wire basket I bought at Homegoods and filled with sphagnum peat moss. My other plants are still growing strong. I added a bunch of purple petunias to my hanging basket which helped him fill out the bald spots. Not only am I President of Hair Club for Plants I’m also a member. I finally got the big blue pots planted. I scored two giant bags of styrofoam peanuts from my local Freecycle group to fill them up halfway so that I wouldn’t need so much potting soil. Saves money, and helps with the weight factor, as well. 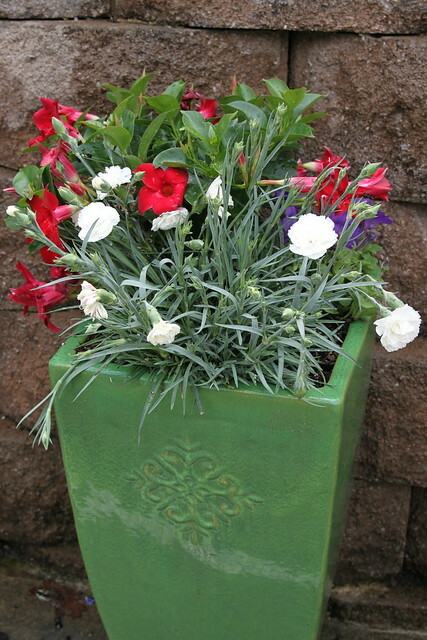 A red mandevilla vine and a white dianthus filled up the green pot just fine. I’m hoping for the mandevilla to spread out over the split face block wall and give me some vertical colors and textures besides boring beige this summer. I packed a bookoodle of plants into these containers in hopes of having them spill over and down the sides like professional planters. All of these guys are full sun lovers and most of them are drought tolerant so hopefully they will survive baking inside these giant ceramic ovens in the Alabama heat that is just around the bend. Here’s a tidbit I learned in my Googling of flowers last week– the more silvery colored the plant, the more drought tolerant it is. Who knew?? Last week Garrett’s watermelon seeds have broken through and seedlings are sprouting! He’s gotten kind of bored with this project already, but I’m trying to keep him into it. I bet he’ll love chowing down on some watermelon this summer. Hope you guys are getting to get your fingers in the dirt as well! I would love to have you join me for the 2nd installation of the Garden Party that’s coming up on Wednesday! I’m loving that peat moss. So unique and pretty. And I’m only moderately jealous that you can plant so early. Okay, I’m really jealous. It’s practically snowing here. Awwwww, thanks Kim! Spring will come! Hang in there. I love the checkered grass, what a new and creative idea! 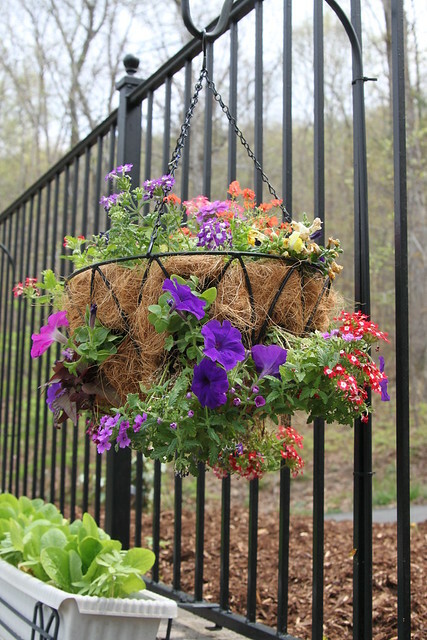 I’m in love with your DIY hanging basket too! I might try that out this year. Last year the verbena was super finiky for me. 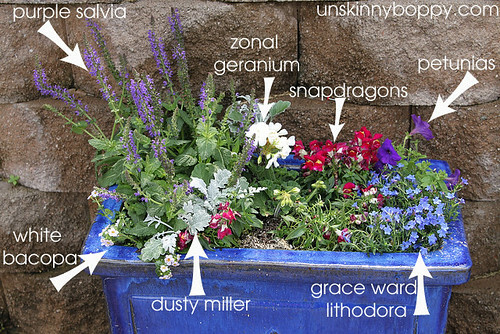 BTW, I’m so incredibly jealous you get to plant these pretty plants already! I’m in DC and we have snow forecasted for wed! 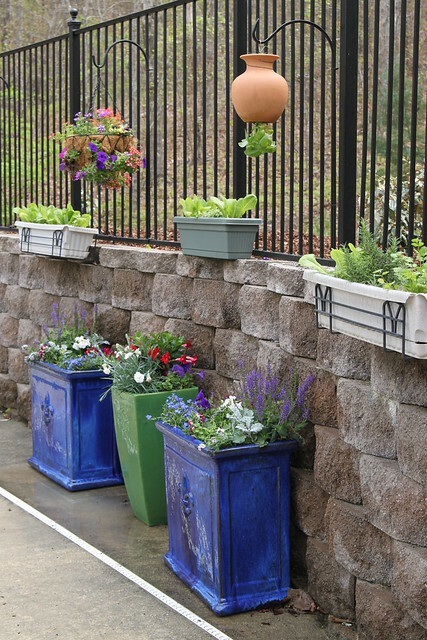 I have ALWAYS wanted to plant a garden but never tried. 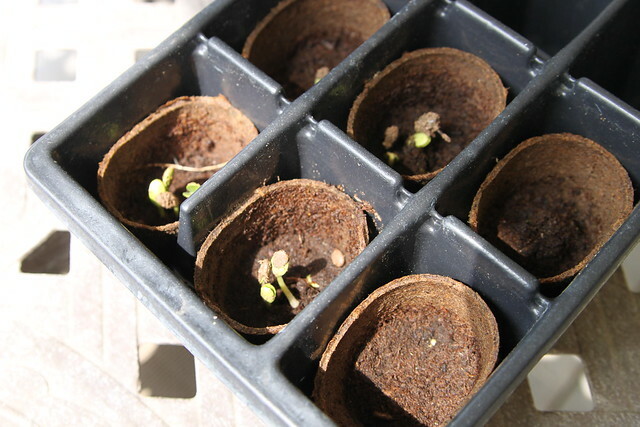 The pictures of the watermelon sprouts makes me want to make a trip to Lowe’s & get started! @Cindy- DO IT!! Planting things and watching them grow is SO much fun and so rewarding! It’s like therapy for me. Love it. Do it. I am so behind in planting this year!!! I need to get on it! Beth, you moss looks amazing…so creative. You have a beautiful home! The flowers are gorgeous too. I love all that color! 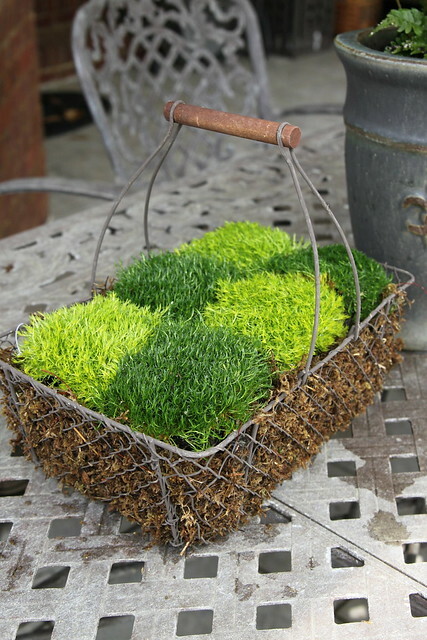 LOVE the checkerboard moss in your wire basket! 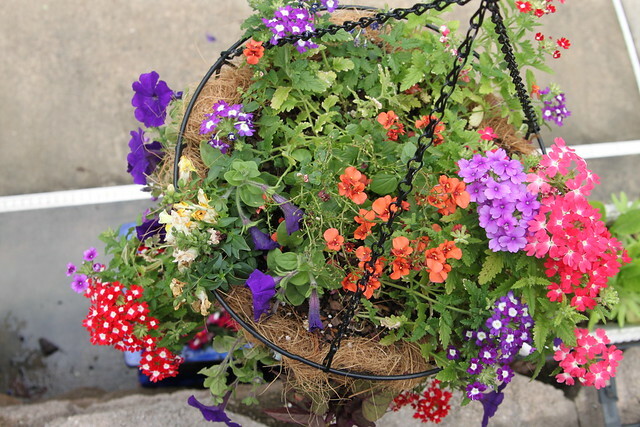 Your hanging baskets are coming along great! How in the world do you keep all those plants watered in the summer? I love your checkerboard too! I have lots of mosses growing around under pine trees and have been digging them up to line pots. I’ve been thinking about doing a fun pattern like that…thatnks for the inspiration.encouragement! You’ve got me motivated to go dig up some more! 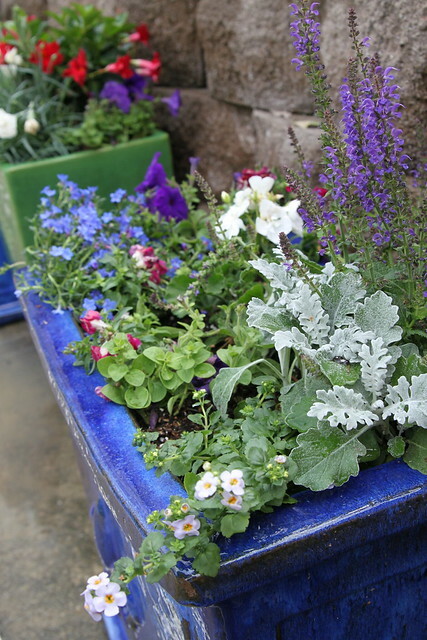 I really like those big blue planters. Great idea about the peanuts added to the bottom. I also love the wire basket of moss. Cute!